Nest Labs revamped the bulk of its product line back in June, when it introduced the Nest Cam security camera (to replace the Dropcam) and the second iteration of the Nest Protect smoke detector. What it didn’t do, however, was launch a new model of its flagship smart thermostat. That might be about to change. According to Business Insider, the home-automation company’s recent filings with the Federal Communications Commission (FCC) reveal that it is working on some sort of new wireless device. The true nature of the device is a mystery for now, but it could well be a new thermostat judging by the FCC label on the back and the test reports filed with the FCC. The said label bears an FCC product ID (ZQAT30) that appears to be from the same series as the IDs associated with the current-generation Nest Learning Thermostat (ZQAT30) and its predecessor (ZQAT77). With “ZQA” being the FCC’s general identification code for Nest Labs’ products, it would appear the “T” here implies thermostat. And if that’s not enough of a giveaway, the label in question is round—the same shape as the firm’s thermostat. This image of a label that will be placed on the back of the device, downloaded from the FCC's website, echoes the shape of previous Nest thermostats. The application that was filed on the 14th of this month first popped up on the commission’s website on Thursday, albeit in a heavily redacted form. The company has requested that the commission indefinitely withhold from public view the forthcoming product’s block diagram, schematic diagram, and operational description. 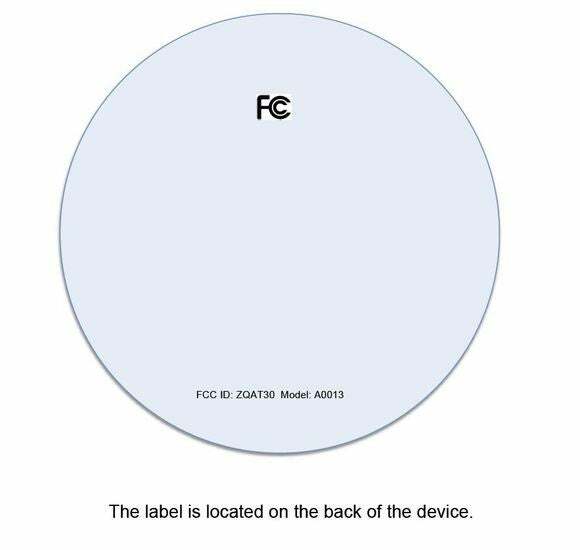 The FCC filings, however, indicate that the device was tested while operating as a wireless 802.11a/b/g/n LAN device on both the 2.4- and 5GHz frequency bands, and that it is also outfitted with a Bluetooth radio. Why this matters: As pointed out earlier, the company recently refreshed its entire product line with the exception of the category-defining smart thermostat. That was a bit surprising as its current thermostat model dates back to October, 2012, when Nest was just a promising startup. Much has changed in the intervening period. Google bought the company for a whopping $3.2 billion in early 2014 and quickly transformed its smart thermostat into one of the most popular smart-home hubs on the market with the launch of the “Works with Nest” program. It’s likely that this new device is designed to excel in that additional role.